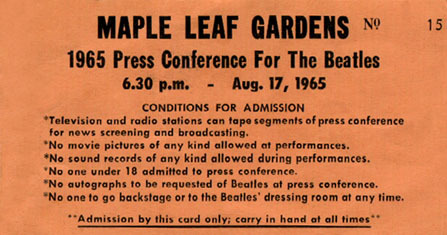 Press conference ticket. Click to enlarge. Schick advertisement on back of ticket. Toronto shares an interesting bit of history with four other venues in being the only places the Beatles performed on each of the three U.S. tours. The other venues were Los Angeles, which included two Hollywood Bowl shows and one Dodger Stadium show, San Francisco which featured two shows at the Cow Palace plus the historic final show at Candlestick Park, Chicago at the International Amphitheatre in '64 & '66 and White Sox Park in 1965, and New York, which had the most appearances by far - Forest Hills and the Paramount Theater in 1964, Ed Sullivan Theater and Shea in 1965, and Shea again in 1966. The Beatles appeared two more times in New York in February of 1964, at the Washington Coliseum and Carnegie Hall for a total of 7 New York appearances (11 shows).